Photograph courtesy Tony Sayer D5218, St Pancras October 3rd 1970, blue livery with small yellow ends with the 'Lion & Wheel' emblem. D5218 most likely recieved this odd combination when it was repaired by Brush, Loughborough during 1966/67. The sixteen year eleven month career of D5218/25068 was split between allocations to London area and Scottish Region depots. The only Class 25 to carry blue livery with the Lion & Wheel emblem? Time between last Classified repair and withdrawal: 54 months. September 1963 to to Cricklewood West (14B). May 1976 to Scottish Region. 25068 was the 35th Class 25 withdrawn, one of four retired during July 1980. After withdrawal 25068 was moved to Glasgow Works on October 4th 1980, being broken up there by the first week of October 1981. At least one of the cabs lingered for a while. Condition June: green livery with small yellow warning panels, curved upper corners, bottom of warning panel covers frame level stripe, straight sided sandboxes, three rung bogie mounted footsteps, engine exhaust located above engine room. 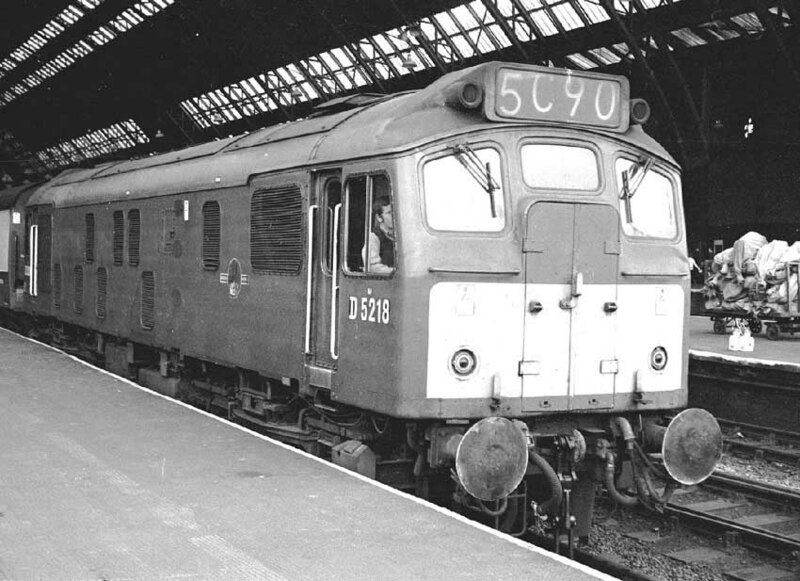 During the third week of June (17th - 24th exact date uncertain) D5218 was noted at Brighton with passenger stock. February 9th & 10th brought chaos and destruction to the Midland lines. The first event involved the 08:07 Harpenden - St Pancras eight car diesel multiple unit which caught fire between Radlett & St Albans. Similar to previous events a drive shaft punctured a fuel tank, over thirty people were injured, many having to jump hurriedly from the blazing vehicle. 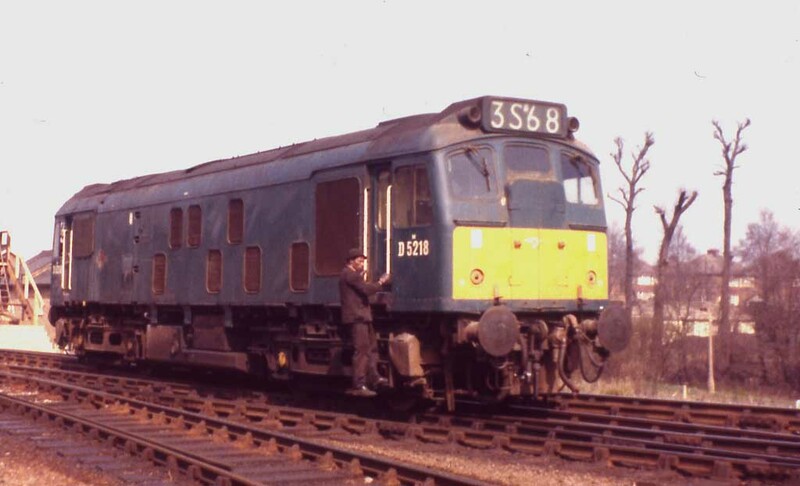 The next day, a few miles away at Flitwick twelve loaded wagons hauled by D5218 ran into a stationary D5383 immediately north of the station. Most of the train was derailed, necessitating the attendance of D7503 and the Cricklewood crane. The lines were cleared by midnight, hindered additionally by a snowfall. The damaged locomotives were removed to Bedford, prior to heading north to Derby Works. 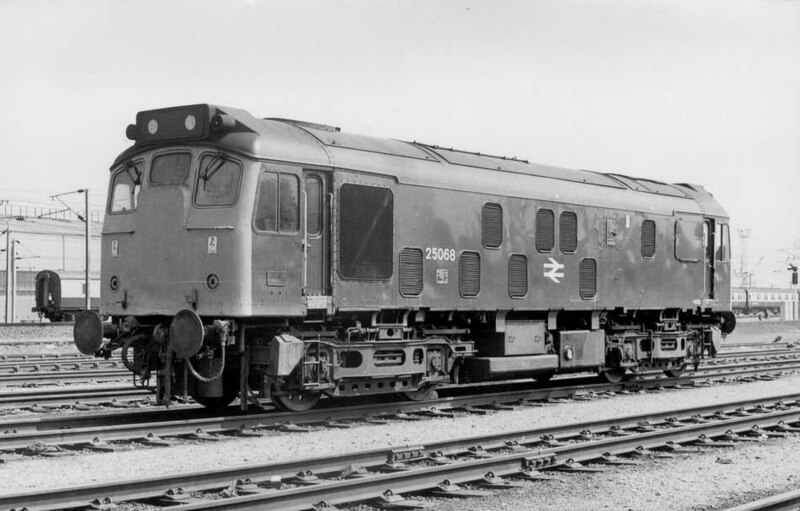 Because of the heavy workload at Derby Locomotive Works, several Type 2s were sent to the Brush Works, Loughborough for repair, including collision damaged D5021, D5218 & D5283. With regard to the June 10th directive to begin painting locomotives in blue & yellow livery on August 2nd Brush wrote to the CM&EE BR at Derby with concern over three points: would the polyurethane paint be used on those locomotives being refurbished at Loughborough; would it be used on new locomotives from the current order and would BR take their stocks of green paint off them if the change to blue livery was to include those locomotives at Brush? The CM&EE BR responded in the affirmative for each question. At the end of 1966 Brush held three collision damaged Type 2s: D5021, D5218 & D5283, instructions had been received to repaint them green, this took place for D5021 & D5218 but on January 5th 1967 instructions were received from A.E.Robson, Chief Engineer (T&RS) to repaint all three in the new blue polyurethane livery. However D5021 & D5218 were outshopped with old-style small yellow warning panels and both received the old style crest! An early passenger working for D5218 took place with D5222 on June 14th 1967 noted with a day excursion from Bedford to Southampton Docks. Photograph courtesy Grahame Wareham D5218, Cricklewood April 1969. January 13th found 5218 & 7524 in use between Windsor and Wembley on an excursion from Huddersfield. The journey set out behind Class 40 No. 269, with the intention to use E3136 from Stockport. As the electric was unable to heat the train the Class 40 ran through to Mitre Bridge Junction, where 6516 took over for the leg to Windsor. As this machine also could not heat the train the Class 25’s were found for the first part of the return leg. More main line running took place on August 24th with the 15.45 Derby - St. Pancras worked by Class 45 No. 11 and 5218. Royal Train duty befell 5218 & 5219 on February 14-16th. The Duke of Edinburgh journeyed from Euston, at 23.00 to Sheffield via Northampton & Leicester. Twenty four hours later he returned to Lamport, near Market Harborough, with the five coach train stabling overnight, before leaving at 7am for Leatherhead via the West London line, Clapham Junction, Selhurst, West Croydon & Sutton. On return the Class 25’s ran through to Dorking, there running round heading back to Wolverton via Sutton, Mitcham Junction & Clapham Junction Overnight heating was provided by a heater van delivered by 5221. On May 6th 25068 & 25069 were used to take the Queen, on the Royal Train from Scunthorpe to Lowton. A mystery excursion on April 6th from Euston to Norwich and return (to Liverpool Street?) was hauled throughout by 25068 & 25069, going out via Northampton & Peterborough), the return route is uncertain. The same pair of Class 25's were still together on May 11th when they worked the 12.50 Nottingham - St. Pancras. Condition June: blue/yellow livery, gangway doors present, no BR emblem visible ob BIS side. There were no recorded passenger workings during 1975 or 1976, during May 1976 25068 was transferred to the Scottish Region. With a working train heating boiler 25068 was diagrammed for many internal passenger workings, on February 2nd, 3rd & 4th 25068 was noted on Glasgow - Fort William workings. Workings from Edinburgh included the 17.10 to Berwick on August 30th and with 25238 on the 08.45 Edinburgh - Aberdeen and 14.35 return on September 3rd 1977. Four day later (7th) 25068 & 26028 worked the 13.35 Glasgow Queen Street - Aberdeen and by itself on October 14th 1977 the 14.44 Glasgow Queen Street - Dundee. 25068 was noted on Ayr depot on March 13th and Eastfield depot on March 19th. On October 6th an SRPS Falkirk - Keighley special became the first service in two years to traverse the link between BR & the KWVR, 25068 brought the special in, handing over to GNR 990 and Standard 75078. 1978 brought a steady diet of passenger workings, on June 1st the 08.15 Inverness - Glasgow Queen Street was worked by 25068, 25007 & 47270, presumably from the outset there were issues with the Class 47? A week later on June 8th 25068 worked the 05.55 Stirling - Edinburgh. The last week of August 1978 was busy for 25068, being active on the Glasgow - Dundee route on the 22nd, 23rd, 24th, 25th & 26th. On 28th 25068 worked the 11.03 Perth - Edinburgh. The final passenger working for 1978 took place on December 9th with 25227 on the 20.10 Perth - Edinburgh, being the portion off the 16.40 Inverness - Glasgow. An adventurous weekend trip from Ealing Broadway to Aberdeen/Inverness March 16th – 18th proved too adventurous as it was curtailed at Aberdeen running over seven hours late, mostly caused by bad weather. The outward leg was taken over at Mossend by 27016 & 25079 to Aberdeen, the return from here featured 25026 & 25068. This pair were also noted on the 12.35 Aberdeen – Edinburgh on March 27th. The return leg of a charter was worked by 25068 & 25026 between Aberdeen and Mossend Yard on March 17th. The same pair worked the 12.35 Aberdeen - Edinburgh on March 27th. 25068 returned to Mossend on June 15th with 25050 on the 22.20 Perth - Euston. On July 23rd 25068 was noted northbound at Perth with a freight. 25068 was south of the border on July 28th working the 08.40 Carlisle - Glasgow Central and was on the same route on August 29th with the 13.40 Glasgow Central - Carlisle. On October 5th 25068 worked the Arbroath trip for the Metal Box Company siding. 25068 was noted stabled at Darlington depot from at least November 17th to 23rd. On November 28th a late afternoon Tyne - Millerhill freight was worked by 25068 & 25265. The final year in service for 25068 was 1980, on March 29th 25068 worked the 18.44 Glasgow Queen Street - Dundee and on June 7th the 15.39 Dundee - Glasgow Queen Street. Photograph collection of webmaster 25068 ended its day on the Scottish Region, but for many, many years it was a permanent fixture on Cricklewood & Willesden area duties. In contrast, for just over two years it was allocated to the Highland capital of Inverness. Seen here at Polmadie, date unknown. 25068 was withdrawn on July 14th 1980. Page added June 23rd 2013.